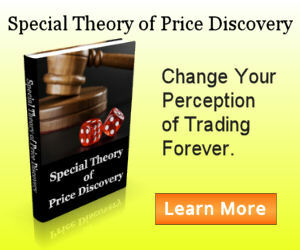 Our proprietary 3-day pattern model classifies daily data into special categories. From the classification, we collect useful statistics and trading biases about the price behaviour of the next trading day. These statistics are extremely useful as the trader can anticipate what kind of trading day he is going to deal with. The trader can also identify early in the day that it is not going to behave normally should some events with low probability happened. Key price levels with the probability of how likely they are going to be tagged during the trading day is provided. The information can be useful for determining the proper entry price level or exit target zone. Following is a sample of the 3DP Report. Intraday Time Bias shows you the statistics on individual time slot during the day. Statistics include Higher High (HH), Lower Low (LL), Higher Close (HC), High of Day (HOD), Low of Day (LOD). Price Level Bias shows you the probability of tagging the well known price levels including the complete daytrading pivot set (R3, R2, R1, PP, S1, S2, S3) and STOPD target levels like 2X prev day price range targets 2H and 2L, prev day high (PH), prev day low (PL). Overall Structural Bias shows you the probability for certain events that are useful to know before the trading day starts. Gap Bias shows you the probability of getting a gap from open and whether this gap is likely to be filled the same day. The dates of the last few occurrences of the pattern are listed in the report as well. So if you would like to study those days in more details, you can pull up your charts and study the price actions on those dates to better prepare yourself for the coming trading day. Take a look at the past statistics reports yourself. You will wish that you know these facts before the trading day begins. 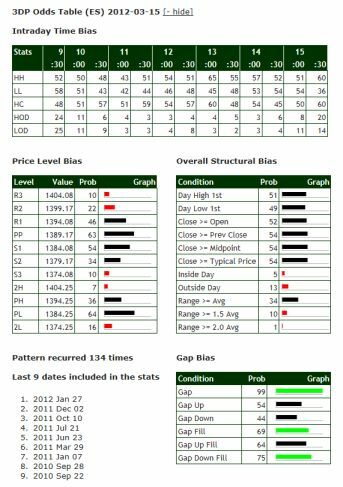 3-Day Pattern Odds Table is available to premium members only. Not convinced yet? Click on a symbol you are interested in at the left-hand side to review it yourself. Back to Market Bias Informant home page.